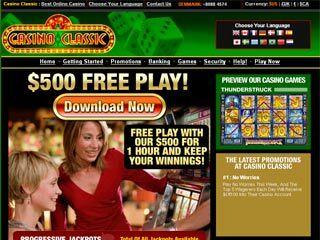 Casino Classic is a truly multinational site offering 14 different language options on its front page and this breadth of options is replicated in the games that are on offer. Different countries have different trends and tastes when it comes to Casino play but Casino Classic manages to provide something for everything. At the time of checking, there were 284 Casino games on offer at Casino Classic, which means there is going to be a lot of choice for visitors to the Casino Classic site and there should be something of interest to everyone with this amount of variety on offer. There is a comprehensive list of every game on offer which provides great detail about how to play and what everything means which makes Casino Classic a fantastic site to use if you are new to the world of Casino gaming or just want to learn more. The games play well but this information is above and beyond what many sites offer. The ability to switch currencies is not something that all sites offer but it is welcoming, either in order to help a player judge their bets better or to get a true judge of what they are earning. Free phone services offering around the clock support and email assistance is the minimum of what sites should be offering their customers and Casino Classic provides this facility extremely well with a range of languages and countries supported by this facility. The signup up bonus starts with each player being offered $500 and then being able to keep what they win within that time period. This is a good incentive for players to go in and really give the site a going over as there is no risk and nothing to lose. If you can rack up a good level of winnings on your first trip, then the site will have you coming back for more. As soon as a player places £20 into their account, they will be eligible for this offer and they will also be given a matched £20 bonus too. If a player is unfortunate to earn no winnings from their opening hour, they have a chance on the Second Chance Wheel. With loyalty points and a referral bonus scheme, there are a lot of reasons to choose Casino Classic as your main Casino site. The chance to bet for an hour on other people’s money is inevitably of interest but Casino Classic managed to offer much more than just this function. A wide range of game, all explained in great detail ensures that the site caters for all type of users and if you want to learn more about some of your favourite games then this site is definitely worth an examination.